I’ve been arguing with my workstation for months on end before I decided to ditch it and get me a new model. I couldn’t find a ready-made desk of the size I needed and with the specifications I wanted, so I went extravagant and got my new desk custom-made. It cost about the same as a regular one from the shop. 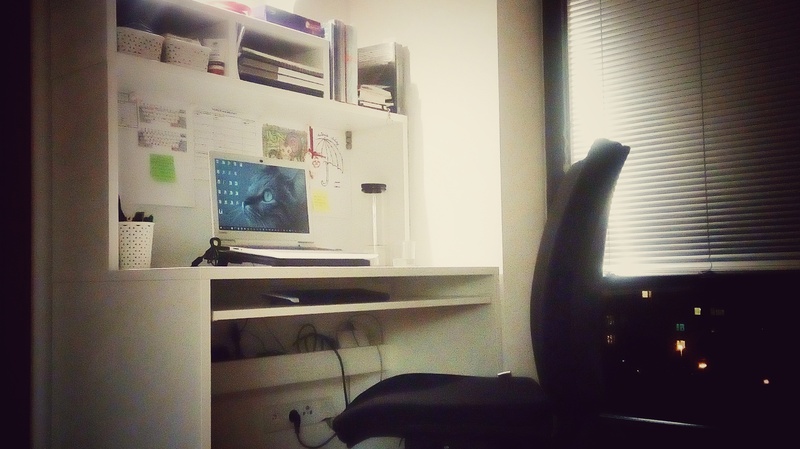 It’s a more spacious and more ingenious copy of my old desk. The desk maker (cabinet maker?) proved to be a man of great insight and fantasy, because he managed to read my crooked hand-drawn sketch of my desired desk and make it just as I wanted. My new chair I didn’t get custom-made but got it online. It’s quite badass and allows for a number of different positions. I like positions. I take weird positions on my chair, typically sitting cross-legged or squatting. I’m weird. I didn’t explain why I didn’t want armrests to be mounted on the chair when the guys brought it in and assembled it for me. Armrests aren’t compatible with the cross-legged position. The best thing about everything is that I miraculously managed to get rid of the old furniture for half its original price. I was advised a good site for second-hand items trading and I sold both the old chair and the old table in quite a short time. I even sold the old chair before I got the new chair, so I spent three days crouching precariously on a foldable stool. I consider myself lucky that I didn’t break any bone or lose any teeth while using it. Something to hate the least today. Great you treated yourself for something that you will get a lot of use from and enjoyment. I see its started snowing as well…..I’ve always been intrigued by the snow when tomorrow here is promising to be 40C…. It looks very good! Terrific that you found someone who could make this for a reasonable price, and also ‘got it’ … what you meant! It all looks clean and minimalistic — just the way I like. The subject of chairs … that’s a chapter of its own. I find it very hard to find a good one here. At least not ‘good for me’. I want to sit upright — not leaning backwards like in some damned beach chair — with good support for the lower back. They’re not at all like the ones we had at work back home. The one I have right now is reasonably good. Best so far. Think I’ll unscrew the arm rests. They’re good for nothing. I’m quite happy with all of this. Worked out better than I had expected. I’m into minimalist design too, my flat is very minimalist, almost sterile. With the desk, I wanted particular features and functionality and didn’t much care about fancy design. I was a bit worried about buying a chair online but I didn’t find anything I’d like in shops. I think the new chair is alright, I wanted one with a straight back too. I don’t normally lean back in the chair. And I don’t use the armrests even when I sit on the chair like a human being with my feet on the floor. I’m not sure how the armrests are meant to be used. You can’t use them when you’re typing, right? At least it doesn’t seem to fit. Oh, and is that a bluetooth keyboard you’ve got on the lower shelf? It’s a wireless keyboard for sure, but with a USB receiver, not bluetooth. I hear bluetooth devices don’t work that great and tend to have glitches in connection. I got the extra keyboard just to extend my options – in case I wanted to change from my usual position – but so far I admit I haven’t been using it. I figured it wouldn’t hurt to have this option though, once I was having the desk custom-made. I use mine all the time … the one that’s positioned on the lower shelf. I find it so much better for the shoulders — no tension. Mine is Apple «Magic Keyboard» (!!!) … bluetooth, but it cost an arm and a leg. I don’t have any limbs to spare, so I picked a relatively cheap tiny keyboard. Which was a good idea, considering I don’t use it yet. I think I’ll get in the habit too. It takes a while to figure out a wholly new workstation and find out which positions are the best (or the least painful). That’s good. It’s funny how much a difference these small things make, like the difference between when you’re perfectly comfy and when you’re vaguely uncomfortable. Haha. I never imagined Sukhasana could be such an adventure! It is! It’s funny how this pose of ease gradually became for me an actual pose of ease, comfy to sit in for a long time. I even manage to keep my back straight no big deal these days. Haha, a fellow office yogi, neat 🙂 And I thought I was a rare weirdo when I’m unable to sit on a chair like a proper person. Your floor sounds fun. Could have a plenty of uses, like barrel rolling. My son uses/used the floor for playing with cars: push them uphill and they’ll roll back down to you again. It’s my pleasure to share a rare weirdo status with you. Also, now I want a crooked floor so I could push my cat uphill and watch her roll back down. Haha, it’s not crooked enough to roll a cat, but a car or a ball works fine. Your cat could entertain him/her self. I’m all for neat, so I’m well pleased. I certainly hope so! Comfort is quite important when one spends so much time at the computer as I do. Having something work out the way you imagined it is a super bonus! Congrats. I like the little shelf under the desk for the cords. All those adaptor things on the cords are so annoying. It’s a great way to hide them. I got very lucky with my new workstation as well as with reselling the old one. I think I almost don’t deserve so much luck. The shelf for cords under the desk is essential. I wouldn’t do without it because the cat would likely chew loose cords, as she’s prone to do, and could hurt herself and destroy the cords. You don’t deserve so much luck? You sound like my son. After he broke his foot a few weeks ago, he said he thought it happened because too many good things had been happening in his life lately. Gah! Oh dear, poor thing! He certainly didn’t deserve such pain. Hopefully he’ll be alright in no time. Well, I can’t believe I deserve everything bad that befalls me. Weird thinking. Negative thinking I think it’s called. I know, right. I have no clue how come I think like that. I see another thing we have in common! I keep all my cords off the floor too. People think I’m nuts for doing so, but, as I’m sure you know, that little bit of effort to create a space to house them neatly is a real happiness booster. I’m particular about the cords primarily because of the cat, who would chew anything lying loosely around. And of course it’s generally safer and more convenient to have the cables tucked away. I can’t see how anyone would prefer to keep the cords on the floor. Why? It’s obvious that people who leave their cords clutter the floor are envious of us who aren’t lazy to tuck them away 😉 Thank you for the link. Exactly what I had on mind. I signed up for their emailing detoxifying challenge, so I’ll see how it goes!